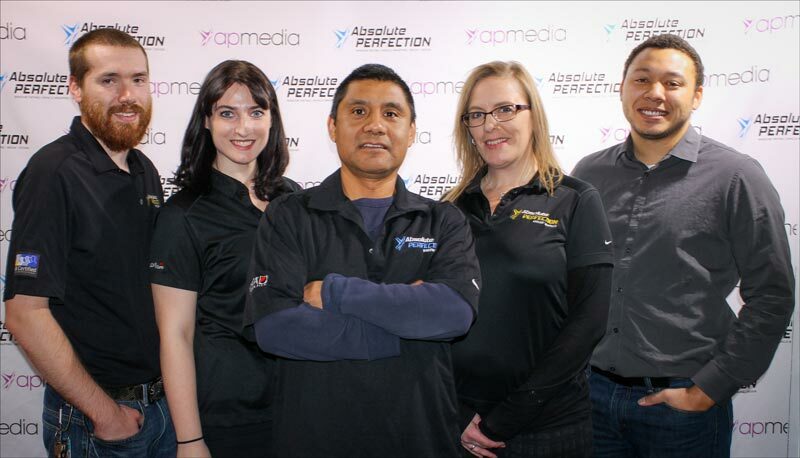 We’re extremely lucky at Absolute Perfection to have so many great employees. Every year we award those who have shone throughout the year by demonstrating talent, dedication, and growth that goes above and beyond expectations. 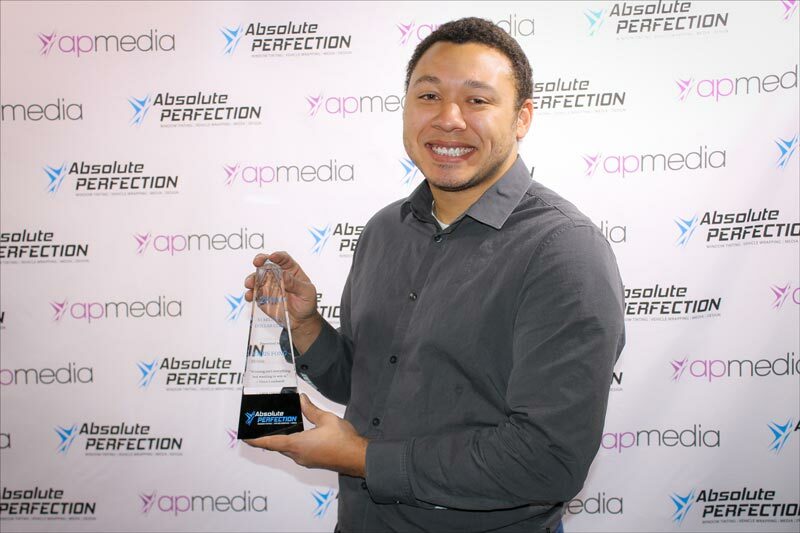 The 2016 Absolute Perfections Awards this year were presented to Becky Duke, Christy Biedenkapp, Brandon Kemp, Elias Castellanos and a special Award to Chris Fong. This award is personally chosen by our CEO, Bill Valway. It’s presented to the team member who shows absolute commitment to the company. They constantly contribute in numerous ways throughout the year, making an enormous impact on our growth. The Most Valuable Person Award is given to the recipient to whom “the company just couldn’t function without,” according to Bill. They are dedicated to Absolute Perfection and show it in everything they do. Our winner for 2016, Becky, is a prime example of someone who doesn’t need years of field training or experience to be successful. She has what few have, which is the ability to retain information, adapt, and be driven 24 hours a day, seven days a week. She works extremely hard and never loses the ability to care for those around her and the people she helps. 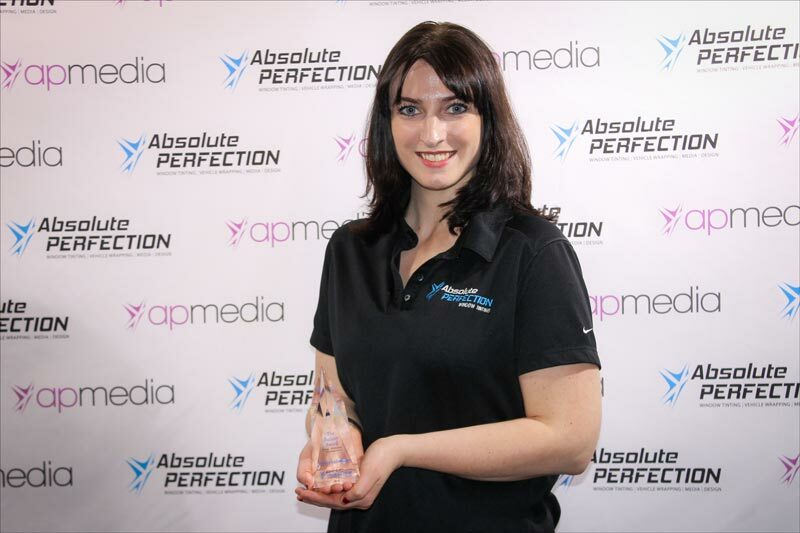 The Always Promoting Award is given to the person who promotes AP and what we offer no matter where they are. We wouldn’t be surprised if they even do it in their sleep! The ultimate promoter, they exude the dedication from every pore and their excitement about AP is contagious. The recipient believes perfection is achievable, inspiring others to believe the same. They have a determination for excellence and have a notable impact on our company. Elias is one of the hardest workers in the company. He is constantly on the lookout to advertise the company and send more clients through our doors. Simple conversations in his personable, friendly tone allow him to gain the trust and confidence of our customers which continuously opens us up to more opportunities. It’s not only future clients Elias is on the lookout for, but he’s also always finding extra help and qualified candidates to bring into the organization. This award’s recipient is always looking to improve themselves and help those around them to do the same. Their work ethic is unquestionable. 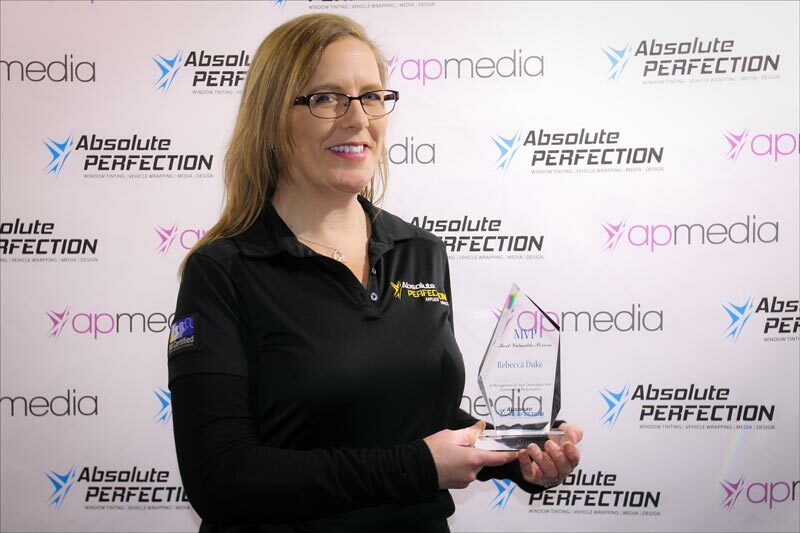 The Striving for Perfection Award winner has a passion and dedication for AP and they are constantly on a drive for more knowledge. They will do the job until it’s done, no matter how many hours it takes. Nothing is ever a problem and “no” is not in their vocabulary. Brandon has taken his role as production manager and made it his own. He has been able to lead his team effectively over the past year and keeps our production line ahead of schedule despite the big tasks that they have been handed. 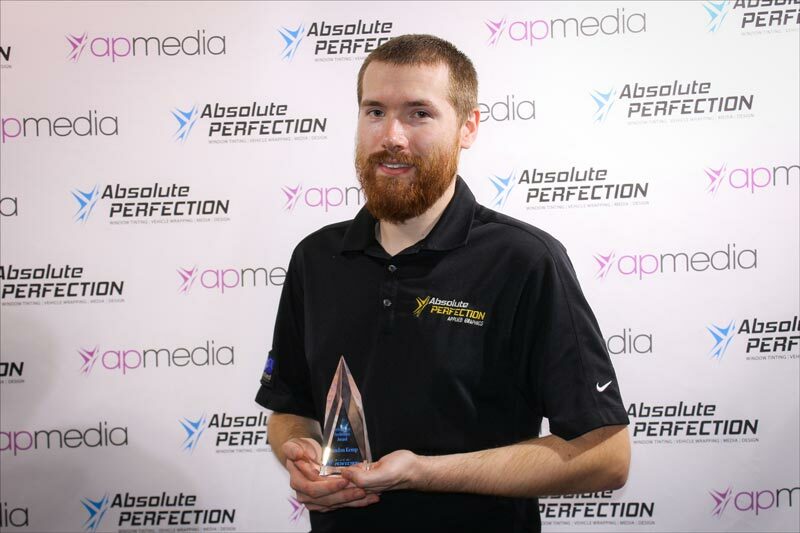 Our company could not function as smoothly as it does without Brandon Kemp behind the wheel of the production team. This is a special award for the AP Teammate that radiates energy, enthusiasm, and encouragement. No matter what, you can count on this person to get the job done. They’re always motivating and pushing our team to be their best while seeking ways to improve AP in any way, shape, or form. This person looks out for their team and is always willing to lend a helping hand. Christy is always willing to take on new tasks and challenges to help the team. She is constantly trying to improve and streamline systems to make it easier on others. She is constantly working on mastering her regular duties so that she can take on more responsibility. Christy has gained tremendous respect from her peers and is ambitious to grow with the company. Chris Fong set a new record, and a new bar to reach for, for Absolute Perfection. By securing the MTA bus contract he also secured our first $1,000,000 dollar sale. Chris is helping to push our company to new heights and is a major part of what makes Absolute Perfection such an awesome company to work for. Chris has taken major steps in helping to push our company towards our long-term goals. He confidently took on the largest project we have tackled to date, and this is only the beginning! We are very excited to see what awesome projects Chris will be bringing in the new year! Elias has been an amazing contribution to AP. Originally from Mexico, Elias mentioned to new installer Brett Perry that he hadn’t seen his mother in 10 years and that she’d never met his 6-year-old daughter. With the backing of AP management, Brett sent out an email companywide to raise funds to send Elias and his daughter home for Christmas. The money donated by the staff was matched by the company and at the awards, Bill, Tim, and Brett handed a shocked Elias an envelope that contained $1000 for Southwest Airlines, $500 for Hotels.com and luggage donated by Christy Biedenkapp and Becky Duke. 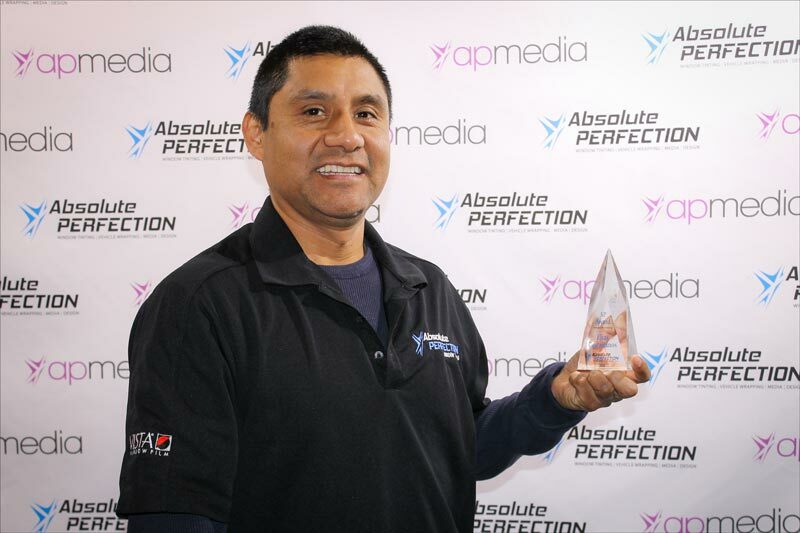 Congratulations to all of our Absolute Perfection Awards 2015 recipients!